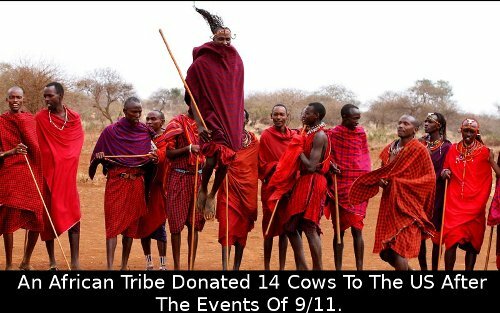 Kimeli Naiyomah, a New York student, born in Kenya, arranged for his tribe to donate cows to the people who survived the events of 9/11. Kenyan Masai tribes-people have never heard of such events, moreover they did not know what a skyscraper means, but they decided they could help with this donation. A traditional ceremony was held, with traditional red robes and jewellery. The gift was received by William Brancick, deputy head of the US embassy in Kenya. He was aware of the fact that the tribe values cows more than anything else and for these people this was an ultimate gift. However, the cattle was not taken to America. Instead, the cows were sold on the local market and the money received was used for buying beads. Masai women then fashioned them with commemorative messages and then they were sent to the people of New York.